To celebrate the birth of a beautiful baby boy. 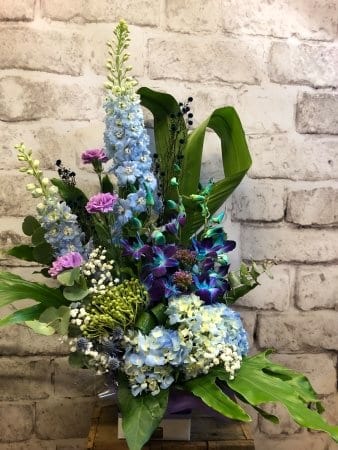 Bursting with Hydrangeas, Blue Singapore Orchids, Sea Holly, Carnations and Brazillian Berry. Newcastle Flowers By Design is a local florist in New Lambton offering same day delivery six days a week to all areas of Newcastle and the Hunter Valley including John Hunter Hospital, Newcastle Private Hospital, Lake Macquarie Private Hospital and Mater Hospital.